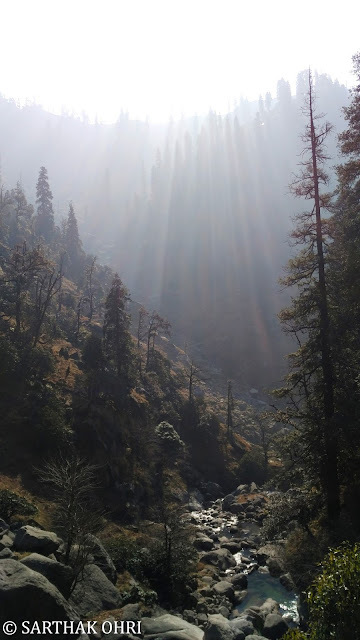 "God hid his gems deep in himalayas, so that no evil finds it"
Long and tiring weeks can really wake up a sleeping venturer in humans, and this was the case with me. 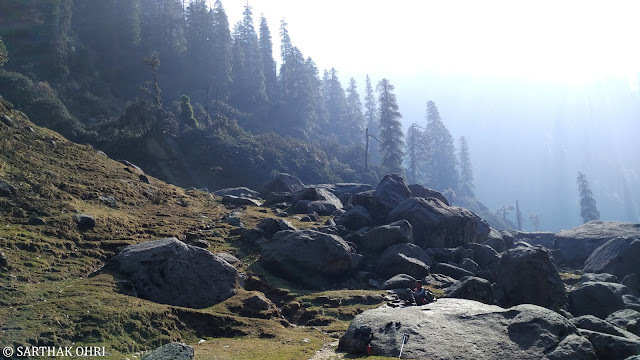 After my Mountaineering course in July, 2015 I hadn't done any high altitude trek, but now was the time. It was winters in February, 2016 but it had snowed less, very less infact. 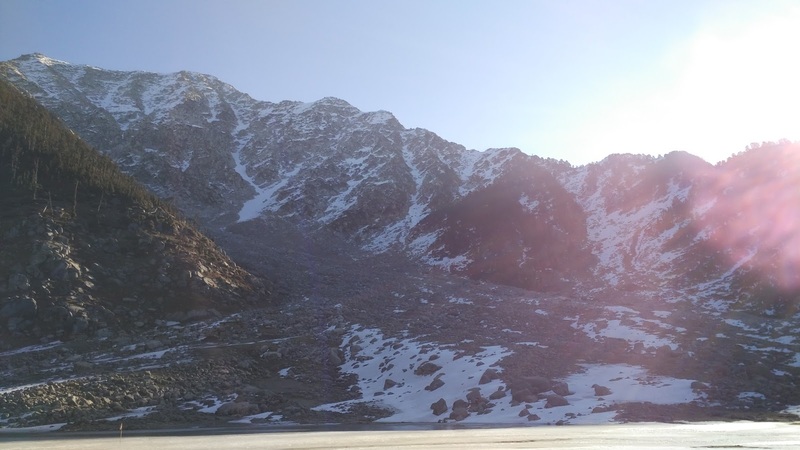 I made up my mind to trek to the kareri lake in the lap of Dhauladhar ranges of himalayas not so very far from my home. 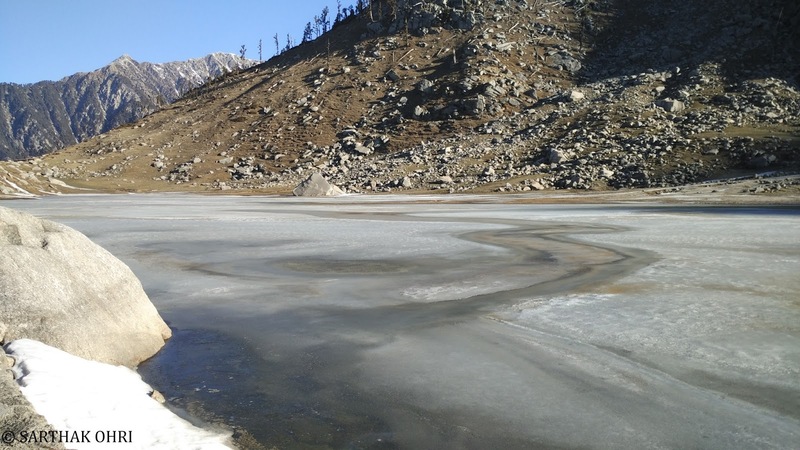 Kareri lake being one of the seven great lakes of Dhauladhars is the only one located in Kangra Valley while other lakes rest on the other side of the range, Chamba Valley. The lake is a 14 km trek which can be cut short to 10 km, provided one chooses to park his vehicle on a bridge which marks beginning of the trail located at Neuli village. This crazy dialogue of driver was enough to make me forget the craziness of his conductor. 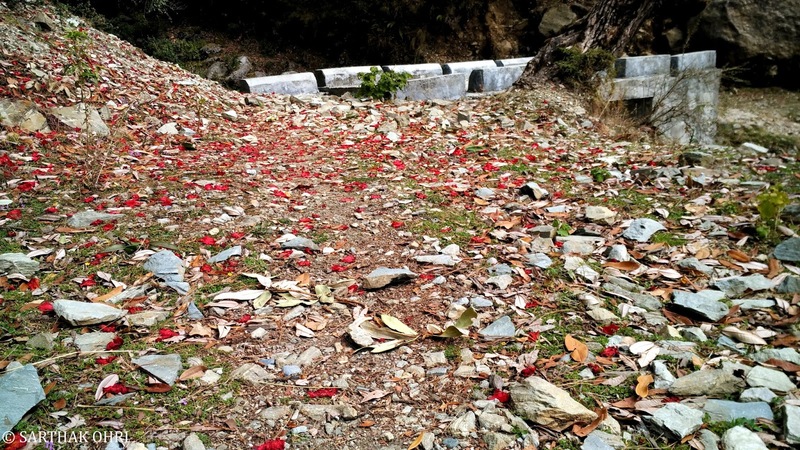 The bus going towards Dharamshala from Pathankot will either go via Gaggal or Charri and the latter route was what I had to take to catch another bus to Gehra from where I had to further travel to Kareri village. But I had to manage in a bus going via Gaggal. 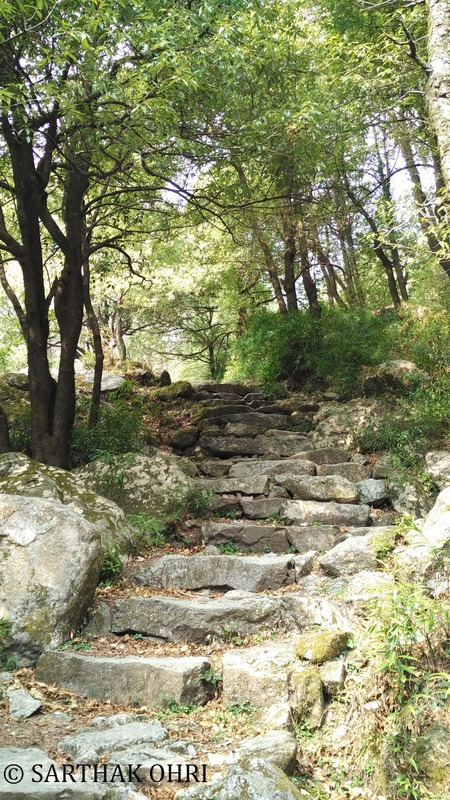 The plan was to step down at a bridge in Chambi (few kilometres before gaggal) from where I could easily get a bus to reach Charri and then another bus to Gehra. The bumpy disappointing bus ride finally ended at 7.50 AM in chambi from where I stepped into another bus going towards Charri only to find that the bus to Gehra had left five minutes ago and next scheduled bus will arrive at 12 noon. Well, These things are a part and parcel of fully loaded adventure trip. How can things go on track when we ourselves love venturing off the track. I managed to walk my legs, infact my full body for another 2 kilometres in search of a cab/jeep or a free lift but nothing worked. Charri was a small village and gehra a miniature version of it and unfortunately no one was travelling towards gehra that day. Somehow I managed to hire a jeep and within half an hour of off roading on Gehra road we reached there and to save another 2 hours of steep climb I hired another jeep for Kareri. Upon reaching Kareri village I met my guide Parshottam. (Find his Number here). 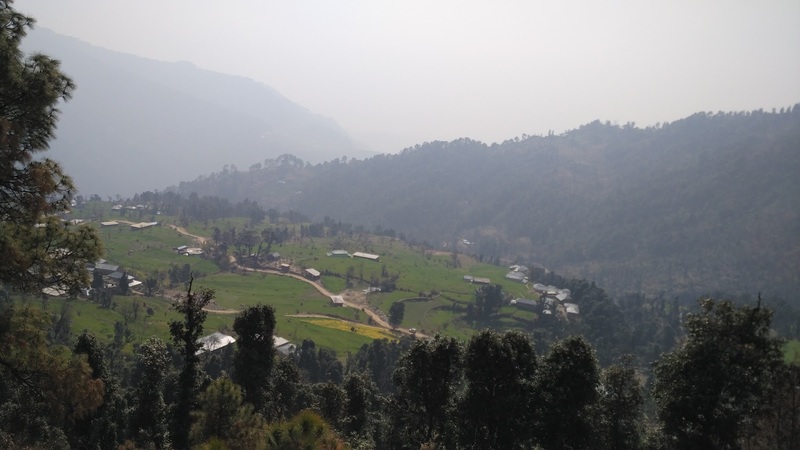 His house was on the edge of a ridge which provided wonderful views of passes of Dhauladhar Passes and various forested ridges on the east. He had his own field where Mustard was grown and this being beginning of spring season, flowers were blooming to the fullest. Field outside my guide house. Initially one has to cross the fields of Kareri village and then step on a road that connects Kareri to Nehuli. After walking for two Kilometers one can reach the Kareri-Nehuli Link bridge and from there take a right deep into the forest. The distance from this point shall be 10 Km. If one travels via Pathankot and turns left from shahpur and then to nehuli village then the vehicle can be parked at this bridge. This way one can save a lot of time which I wasted commuting from gehra to kareri. Initial climb involved cut steps which appeared steep. It took me around two hours to climb these steps to reach other side of hill. 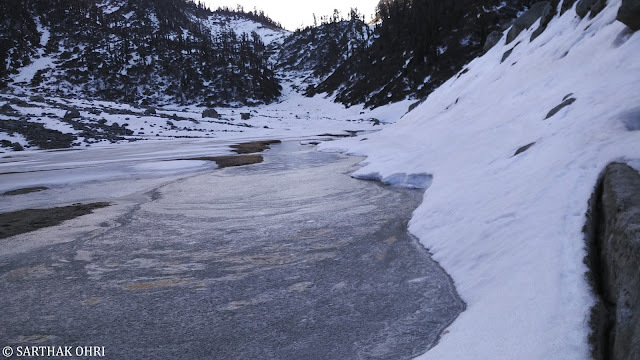 The river Niyund originating from lake shall accompany you throughout the journey. Hearing some gunshots can be scary, it smelled of poaching. Probably some bears were hunted for someones greed. These illegal activities are common in such territories. Trail begins after turning right from Bridge. Not sleeping the night before trek can be adventurous and risky and I love both. 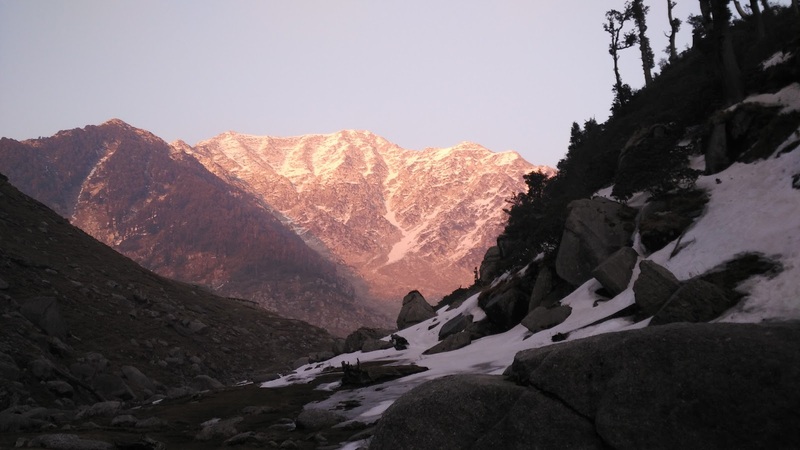 I hadn't completed even half of the trek and I could feel the aftereffects of less sleep combined with high altitude. In such a situation chocolates can be a life saver. My guide was always 200 metres ahead of me and I walking in some sort of hangover clicking photographs managed to keep the pace. 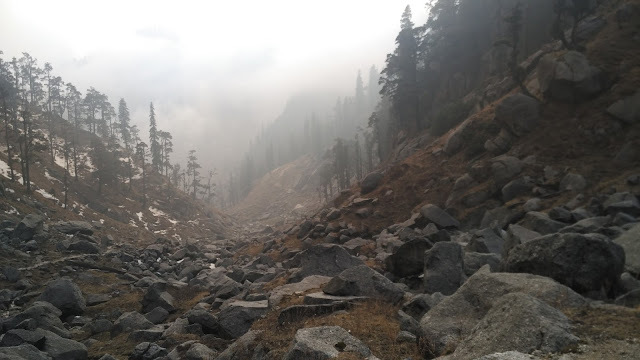 Walking few metres and stopping for a minute was something I had never experienced to such an extent earlier and soon we reached the midway of our trek , a beautiful camping site and first glimpse of snow on upper reaches. There is no shortage of water throughout journey as river Niyund shall always accompany you. The route becomes more and more beautiful with a blend of boulders, Devdars, Rhododendron Trees, and a small river flowing through them. The river has various crossings which are the part of trail. While at some places there is an Iron bridge and at some only a wooden log to cross. Though knee deep water doesn't create much of problem in case one has to cross barefoot. There is a shop at midway camping site which is operational during season and stocks chocolates and somw basic eatables for hikers. February being an offseason, the shop was shut. The area has some wildlife which consists of Black Bears and Leopards but they don't hover around in winters and prefer to hibernate. In winters they may also try to come to low altitude in search of food. 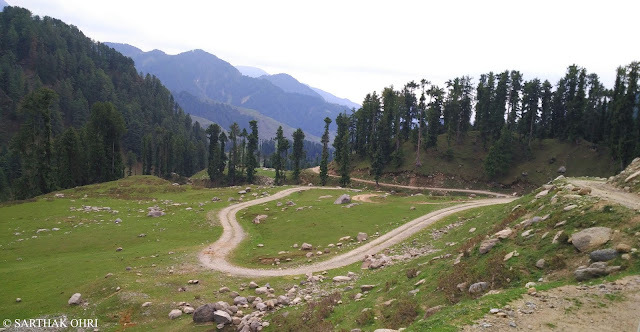 In summers they try their best to stay away from disturbing human population and stay on dense forest ridges. In summers one can see many cows, sheep and goats along with shepherds who camp here for some days before Crossing passes of Dhauladhars to enter Chamba valley. 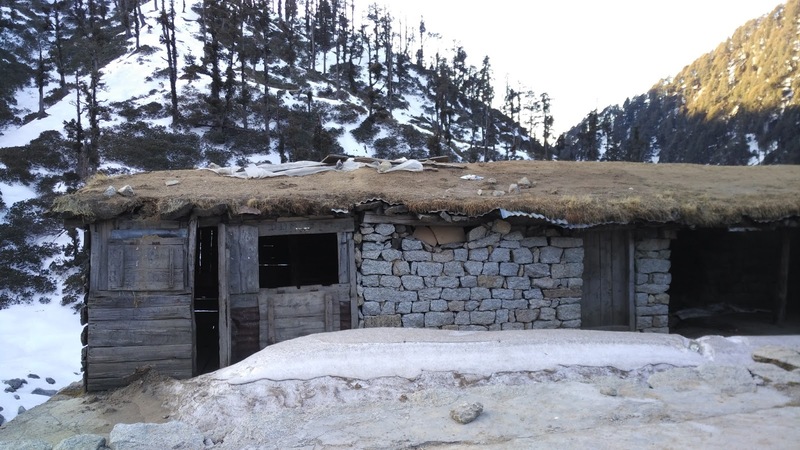 The shepherds come to Kangra in winters, and in the months of April they cross the Dhauladhar range to graze their Cattle in Chamba valley and then Via Kailash Manimahesh route, They cross Kugti pass to enter Lahaul Valley and prefer to stay their post Monsoon. In October they again come back to Kangra Valley before the High passes shut down due to heavy snow. I looked at my watch which reas 5.30 PM and we were half kilometre short of lake. 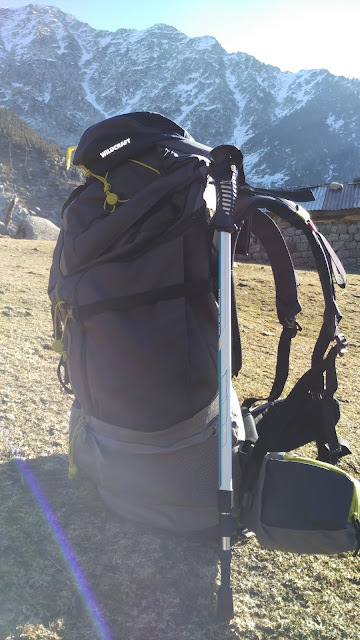 We managed to find some dry wood to be used as fuel to cook our delicious dinner which turned to be another setback in this trek later on..
Just few hundred meters before the Lake The Majestic Dhauladhar Range with Minkiani Pass can be spotted. 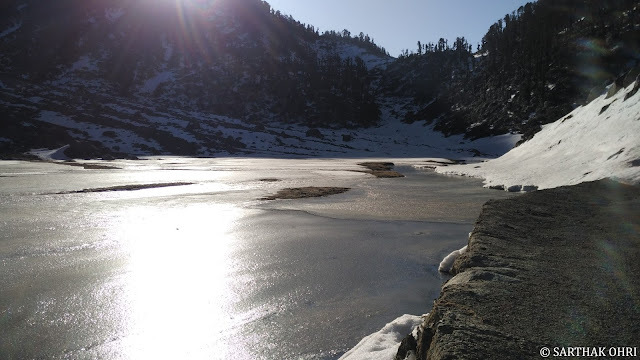 First view of Frozen Kareri Lake in evening. 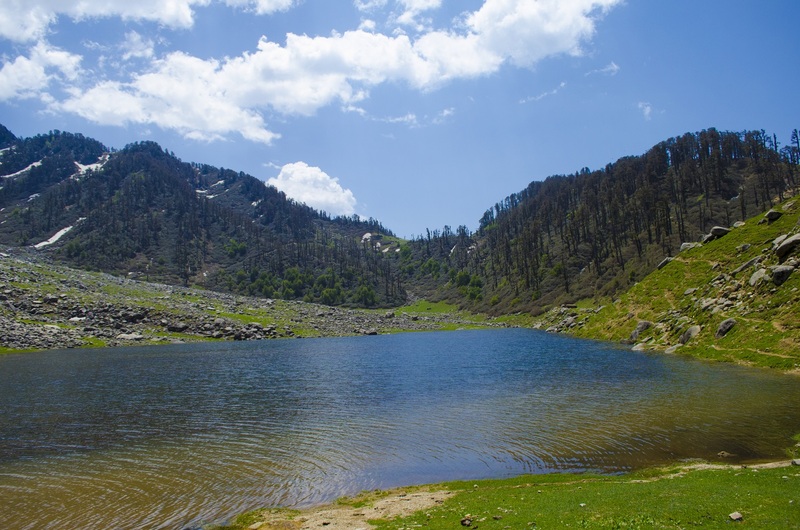 The lake is surrounded by meadows that serve a grazing ground for cattle owned by shepards (Gaddi in local dialect) and a camping ground for humans. 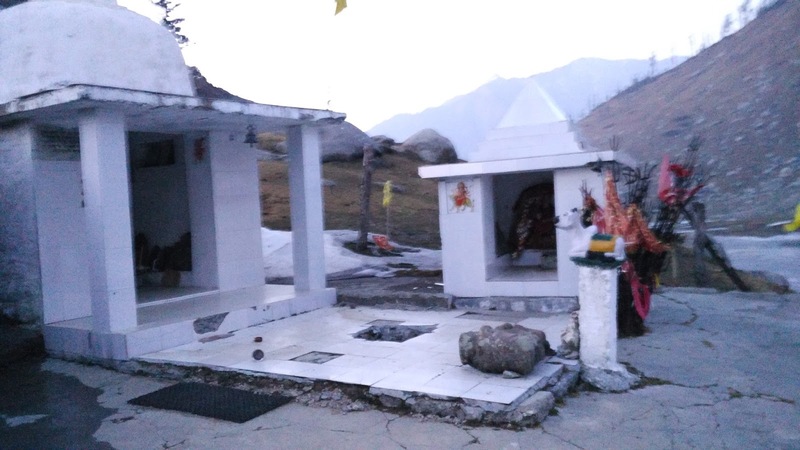 The lake has a well maintained temple dedicated to Lord Shiva which serves as an important pilgrimage to people of Kangra Valley and a fare is held every year in August at the lake. If one chooses to hike during those days he may need not carry food and camping gear. Locals of kareri village set up a lot of camps to serve the pilgrims and the food is plenty. Best times to visit are April-November. In April the Rhododendrons are at full bloom and that makes it a picturesque place to visit. 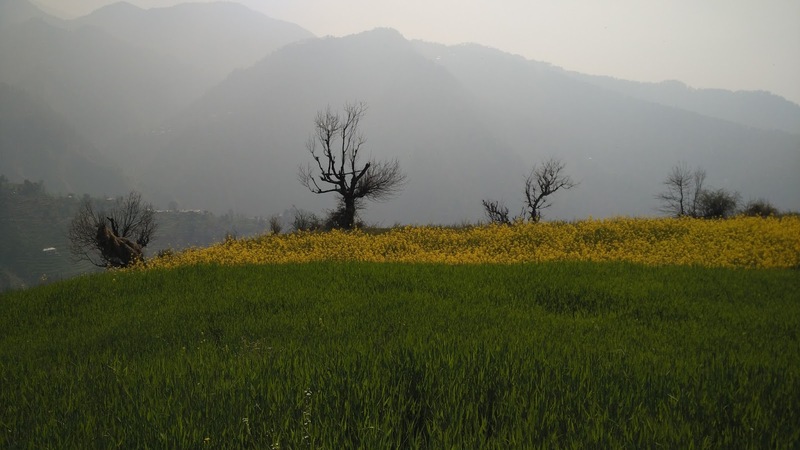 This place should be avoided during monsoons, but post monsoon the Lush green valley can be alluring to eyes. 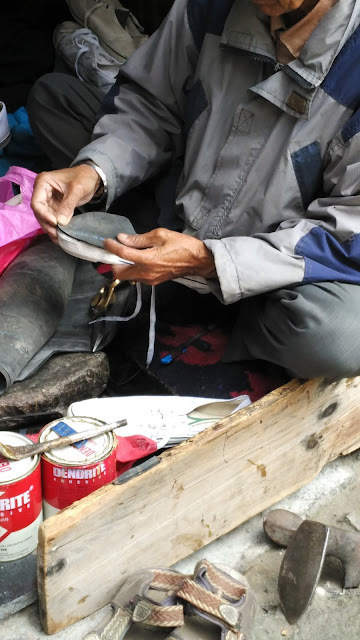 There are few temporary shelters for visitors that can accommodate around 60 people in emergency so one doesn't needs to carry a tent or tarp. Temple has utensils kept in a room for visitors so we did not face much problem. The first glimpses of lake were magical moments. 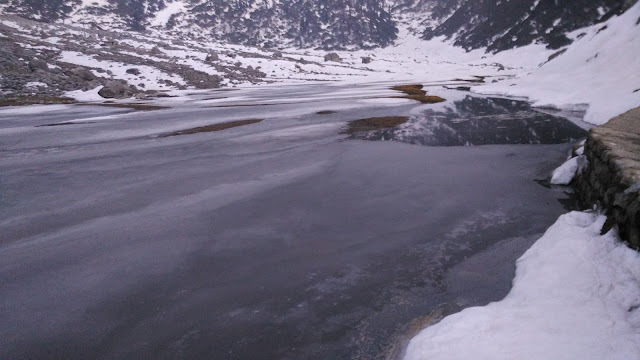 A completely frozen lake and I madly wanted to jump over it. We filled a bucket with that icy cold water to prepare our dinner. Finding water in liquid form can be another challenge if the water is hard frozen. 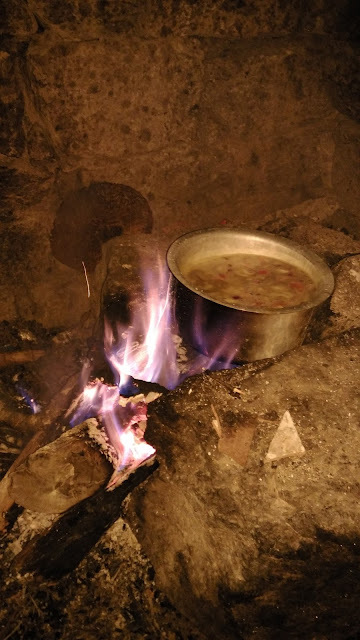 Dinner was Khichdi my guide made while I assisted him and arranged our sleeping gear. Wasting food is something I have alwaya criticised but when the food is something that can burn you out, I prefer to forget my ideology for sometime. Food he cooked had a lot of chilli something Beyond my requirement and that was the primary reason of my bad throat that night. Another bubble bursted when potatoes he had put weren't boiled properly. Though I couldn't complain the way I was feeling due to my respect towards my elder Guide and hardwork he put into, but somehow I tried to avoid the same stuff in morning and preferred to survive on my biscuits. These things can be considered normal in such circumstances but the food had actually imparted in a negative way on me next morning. Shiva Shakti Temple at the lake. Freshning yourself up with icy cold water can be a deadly task but another necessity to fulfill. Putting hands in ice is quite equal to a big electric shock, as if the whole world stands still for a moment especially when you had a bad throat and stomach ache after eating unboiled food last night. We Offered some prayers in temple for our safe journey and we left the place after spending some quality time near lake absorbing the early morning sunlight. The morning sun was narrating an altogether different story the setting sun had narrated last evening. It was a combination of sunlight reflecting on melting snow with light soothing warm air after a cold night which had recorded -4 degrees. Cherishing the heavenly moments we returned safely and the trek ended well. Kareri Village as seen from the trail.